These scripts are for the Greasemonkey extension for Firefox. 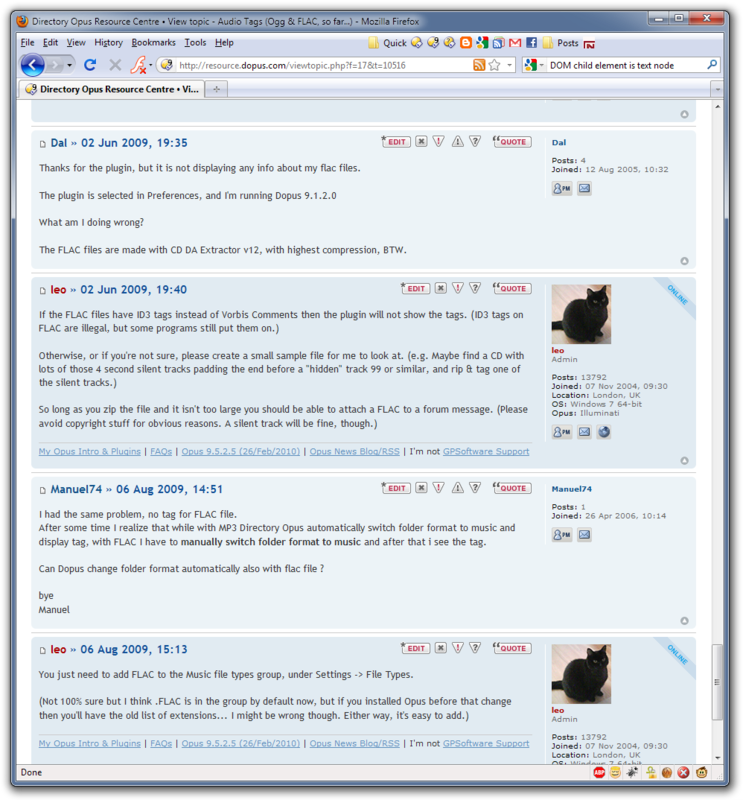 When viewing phpBB 3.0 forums which use the default prosilver theme, the scripts will rearrange things slightly or add some extra features missing from the default theme. 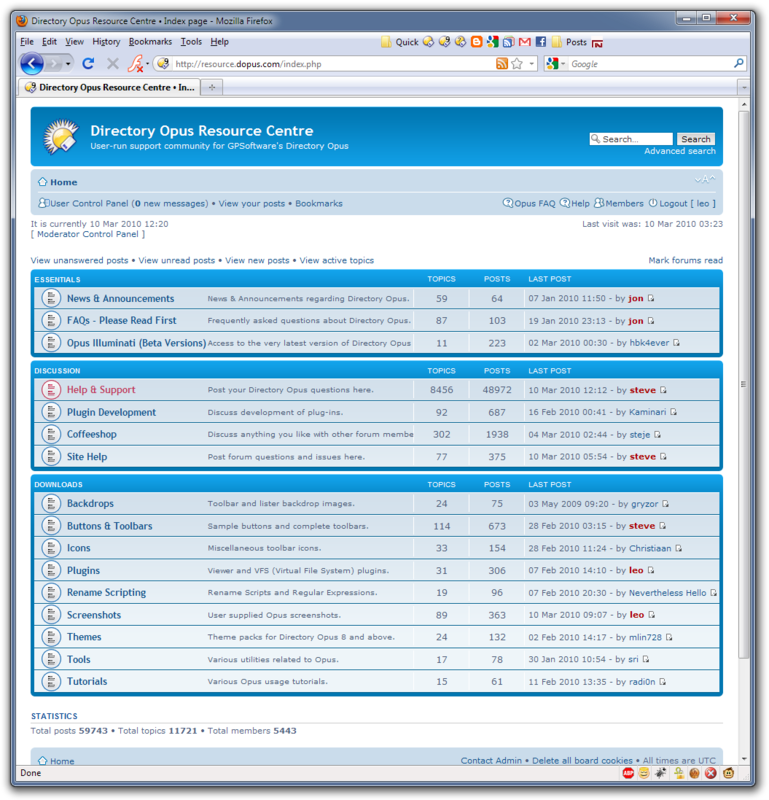 The scripts will not work with phpBB 3.0 themes other than the default (prosilver) unless they are very, very similar (e.g. just a re-colour). 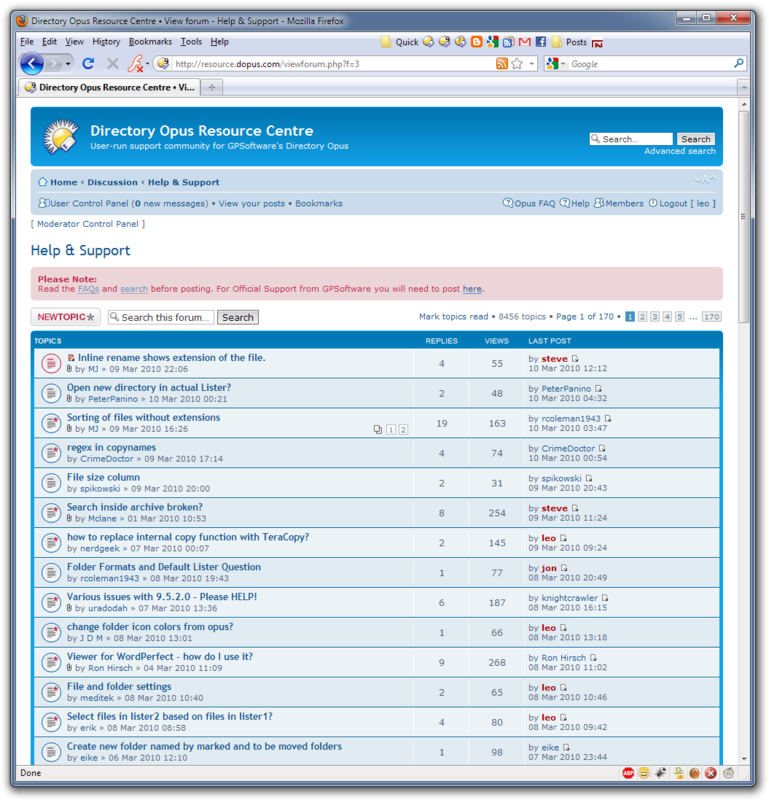 The scripts will not work with phpBB 3.1 or above. The theme changed and the scripts need updating. I've decided to change the theme on the forum I run instead of update the GM scripts, sorry. 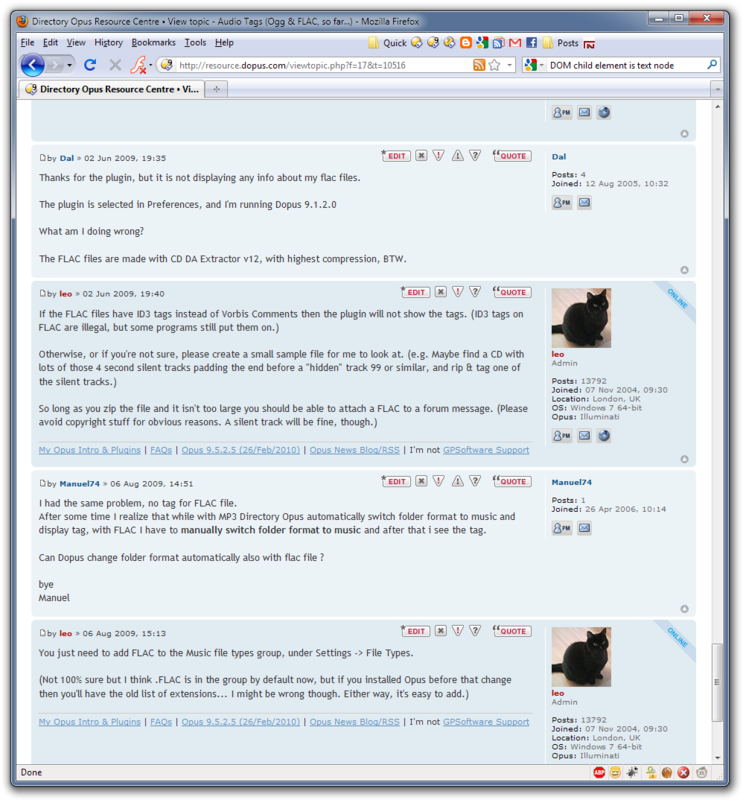 The scripts have only been tested on English forums. In other languages there may be problems due to date/time formats, the order of phrases, etc..
As with any Greasemonkey script, if you notice anything wrong with a site you're viewing, try disabling Greasemonkey and then Ctrl-F5 to force the page to refresh and check if the problem is with the site or with the changes the script makes to it. 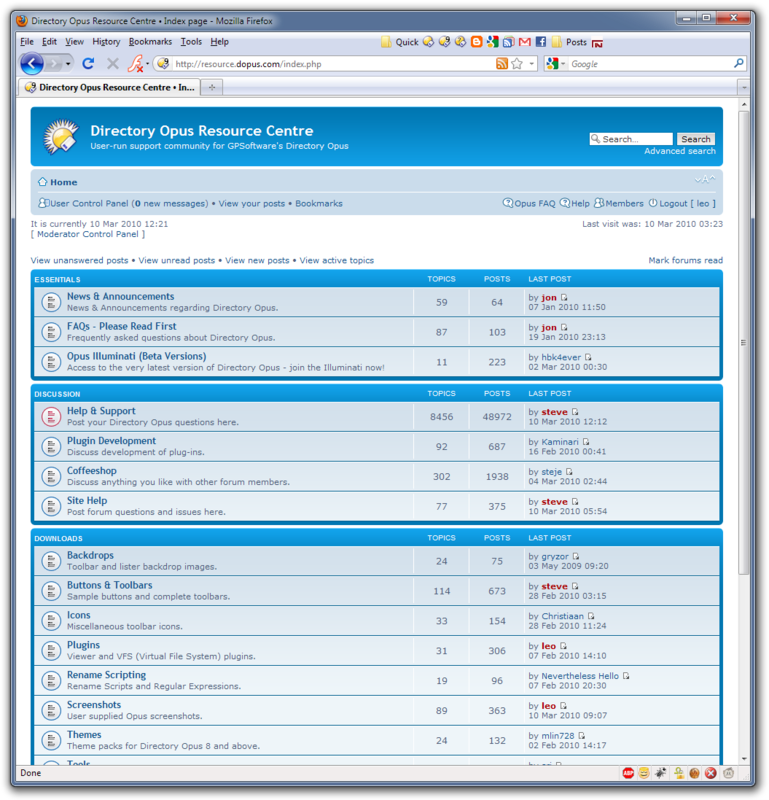 I made these to make reading the Directory Opus user-to-user forum easier. They're my first Greasemonkey scripts. They're unlikely to be perfect but I hope they're still useful. Rearranges forum lists and topic lists so their columns no longer have multiple types of data interwoven. Makes it easier to see who is saying what in threads. The name of each reply's author is larger and comes first. (By default, prosilver displays the author as tiny, secondary information.) Separators are also added between replies so that the pale-blue reply backgrounds don't all blend together on the white page background. The script will apply itself to http://resource.dopus.com/* by default. You'll need to adjust the list of include URL patterns if you want to try it on other phpBB3 forums. This script adds "Next Topic" and "Previous Topic" links to the top and bottom of the page when viewing topics on phpBB3 forums which use the default prosilver theme. The script will apply itself to http://resource.dopus.com/viewtopic.php? * by default. 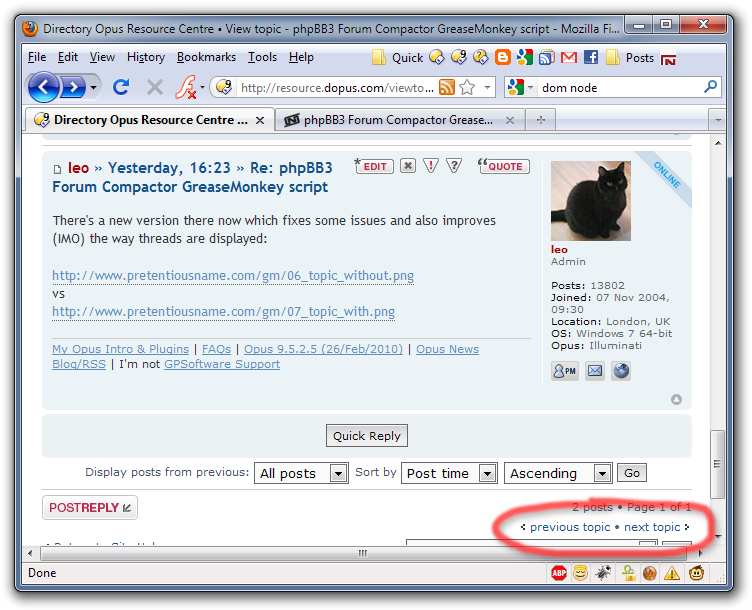 You'll need to adjust the list of include URL patterns if you want to try it on other phpBB3 forums.